AquaCare Dental Air Abrasion & Air Polishing System for Cavity Preparation, Cleaning & Stain Removal. AquaCare is a revolutionary dental product in the field of contactless dentistry and Minimally Invasive Dentistry - M.I.D. making routine dental procedures painless for patients. Designed to deliver abrasion and prophylaxis, the AquaCare treatment center empowers the clinician to switch easily between dental procedures. Pressures and media settings do not need adjusting for differing treatments. 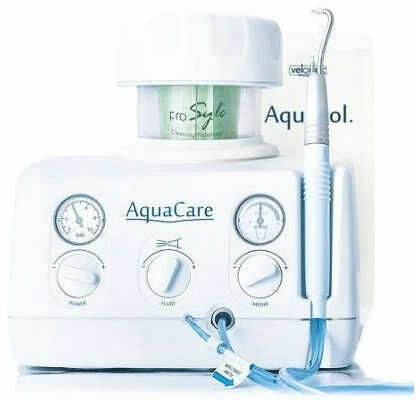 In cutting mode, AquaCare is used for the preparation of cavities without the need for anesthetic or drilling. The AquaCare cuts quickly but conservatively, minimizing the removal of sound tooth material and eliminating the risk of chipping or stress fracturing. Unlike conventional rotary cutting instruments, the AquaCare is not in direct contact with the tooth structure. There is no vibration, heat generation, noise or smell. In cleaning mode, the AquaCare delivers highly efficient stain removal and cleaning. It also increases the effectiveness of tooth whitening procedures. The AquaCare can clean into the very fine structure of the tooth, which conventional cleaning systems cannot do. The AquaCare main feature is the patented handpiece. The handpiece delivers a high-speed fluid stream to create a liquid curtain around the abrasive medium. The fluid is fed from a self-contained reservoir within the AquaCare unit. The fluid stream eliminates free borne dust particles and is comfortable for the patient. The handpiece delivers full access in the mouth as it has no cumbersome powder pots attachments. It is light to hold, easy to maneuver and works equally well with cutting and cleaning materials. The main airstream that contains the particles exits the handpiece at around 80 psi. Speed and powder controls on the AquaCare allow the dentist to adjust the pressure and the amount of powder that feeds to the handpiece. The handpiece is autoclavable and comes in two color-coded cutting sizes. The long life tungsten carbide cutting nozzles can be easily changed depending on treatment. The AquaCare includes a triple-action foot control that enables cut, clean, wash, and dry operations to be carried out through the same handpiece, allowing continuous operation without interruption. An entire procedure can be performed without removing the tip from the oral cavity. One handpiece supplies air, water and/or treating medium. The powder for the AquaCare comes in self-contained powder cartridges that allow for quick and easy replacement. The cartridge has an inbuilt feed system that eliminates blocking. It also allows for fast, efficient no mess changes between materials and avoids mixing and possible contamination of the powders. The AquaCare currently works with 4 different powders, with more materials in development. Color-coded, disposable powder cartridge system ensures quick, hygienic refills and powder grade changes. The AquaCare is completely air driven with no electrical parts requiring less maintenance than electronic equipment. There are also no pumps and no leaking as the AquaCare works entirely with air pressure. The AquaCare provides fast, efficient cutting and cleaning with very high levels of patient acceptability. Cutting Media: 53 and 29-micron aluminum oxide: Powder rate infinitely variable between 0 and 6g/min - 0.2oz via rotating switch and pressure gauge. Handpiece: Anodized aluminum with separate integral powder and fluid channels - both operated by foot control. Nozzles made from stainless steel tube with Tungsten Carbide Tip. Handpieces incorporate a quick release system for convenient changeover of cutting sizes. Color-coded handpieces for simple tip-size identification. Shipping Dimensions: 14" x 14" x 12"